Cookie dough ice cream is nice, but red velvet ice cream with red velvet cookie dough is a whole lot more fun. This buttermilk-based ice cream is packed with cookie dough and is pretty on the eyes. I know reality TV is so 2002, but it’s still pretty much my favorite variety of television. All I can really handle in my life right now is mindless, easy television that I can watch while I’m doing one of a million other things, including working, writing blog posts, recipe planning, playing/cuddling with my dog, and/or accidentally passing out on the couch. I just love that I can half watch shows like The Bachelor and still, for the most part, understand what’s going on. Also, it’s oftentimes ridiculous and indulgent, which I absolutely love. I think most of us could use a little bit more ridiculousness and indulgence in our lives and I feel no shame in getting that from my television-watching. And from my ice cream, too. I mean, I think red velvet in general is kind of ridiculous and indulgent, but in the most fun way possible. Turn it into ice cream and add in red velvet cookie dough (double the red velvet!) and I’m just ridiculously happy. That’s what I did here and I ended up with one of the most fun ice creams I’ve ever made. I tried to keep this ice cream pretty true to red velvet, so I made it with buttermilk instead of milk and mixed in a little cocoa powder, too. I was going to do a cream cheese swirl, but started craving cookie dough and thought a little red velvet cookie dough would be even more delicious (sue me, but I’m not a huge lover of cream cheese in desserts). I ended up putting some of the red velvet cookie dough in the ice cream and then snacking on way too much of the remaining. Oops! 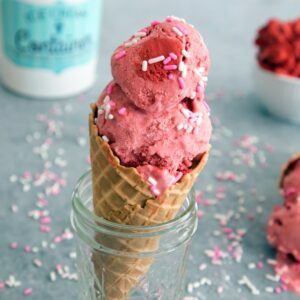 The red velvet ice cream is a pretty typical custard-based ice cream and I promise it’s not difficult to make. It just requires a whole bunch of chilling time, so make sure you plan ahead! I’m big into making homemade edible cookie dough these days and it’s super easy to do, too. Obviously there is no baking required! It just requires mixing all the ingredients together. And then trying not to eat too much before you mix it into the red velvet ice cream. If you thought reality TV was indulgent, you should try eating red velvet ice cream with cookie dough on the couch while watching reality TV. But come on, you work hard and you deserve it. I haven’t watched Big Brother since college, but I got a little sucked in this season. It’s so bad that it’s good. That really is a thing. The funny thing is that I would absolutely never be on a reality show. Chris basically died laughing when I asked him if he could see me on Big Brother. He said I’d be the worst player in history because I’d feel so bad about making anyone else feel bad or having to lie to anyone. True. Also, I’d pretty much just want to sit in my bed reading a book and would basically avoid getting involved in drama or talking to anyone. Producers would love me. 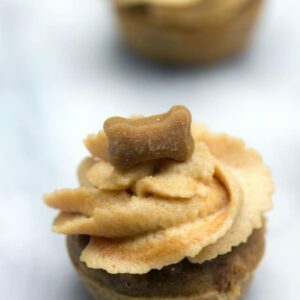 However, I might actually make a lot of friends because when I wasn’t hiding in a corner with a book, I’d be in the kitchen whipping up treats like this. If they let me? I am still not totally clear what they eat on Big Brother when they’re allowed to eat. Do you think they’d have an ice cream maker stocked in the kitchen? Would they purchase buttermilk upon request? Could I bring my own? I have so many questions. But I don’t have any questions on my love for this red velvet ice cream. It’s different from other ice creams in that it has a distinct tartness (not quite as intense as yogurt) from the buttermilk and a little bit of richness from the cocoa. 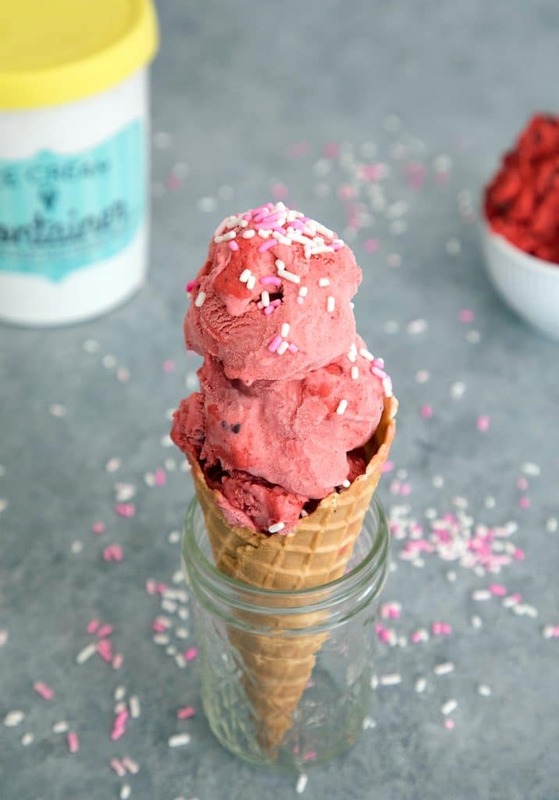 It’s fun to get bites of red velvet cookie dough and obviously looks pretty in a cone. All very important things when it comes to ice cream, in my opinion! I’m sure this won’t be the last ice cream you’ll see around this blog this summer. Let me know if there are any flavors you’ve been dreaming of that you’d like to see me whip up! Are you a reality TV fan, too? Or am I all alone in my television watching shame? If you’re looking for more recipes for edible cookie dough, be sure to check out my Red Velvet Cookie Dough Bars and my Funfetti Chocolate Chip Cookie Dough Cupcakes. I’m also dying to try this Cookie Dough Smoothie from Nourishing Amy! Heat heavy cream, buttermilk, sugar, and salt in a medium-sized saucepan over medium heat. While cream/buttermilk is heating, lightly whisk egg yolks with cocoa powder in a separate medium-sized bowl. Pour half of the warm cream/buttermilk into the bowl with the egg yolks, whisking while you do so. Then pour the egg mixture back into the pan with the rest of the cream/buttermilk. 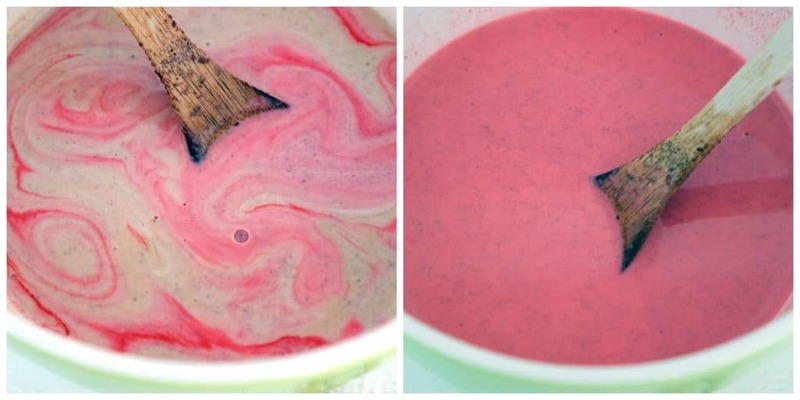 Mix in vanilla extract and red food coloring. 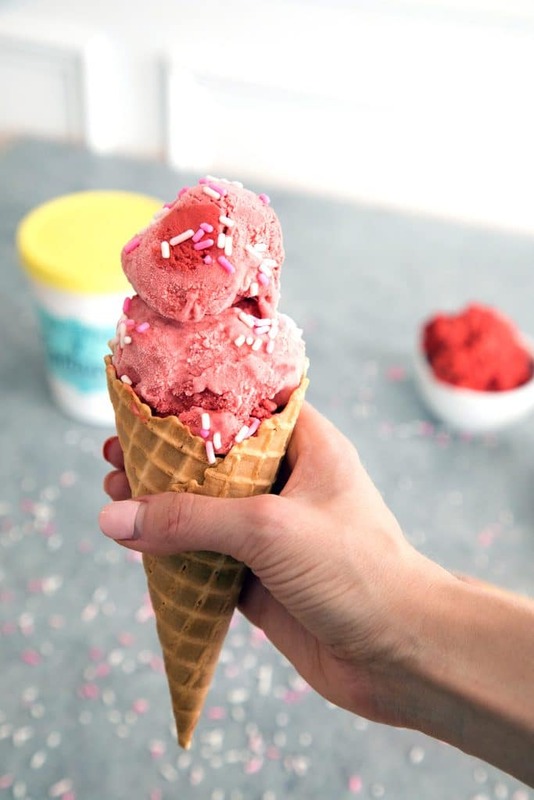 Once mixture is chilled, freeze in an ice cream maker according to the manufacturer’s instructions, mixing in pieces of red velvet cookie dough when ice cream is almost done processing. In the bowl of a stand mixer or a large bowl with a hand mixer, cream butter and brown sugar together until light and fluffy. Slowly beat in flour and cocoa powder until combined. Stir in buttermilk. Add red food coloring and mix until combined. Refrigerate cookie dough for at least one hour. 38 Responses to "Red Velvet Ice Cream with Cookie Dough"
I’m a little too obsessed with all of the Real Housewives series…ugh. Totally need this, like, asap!! This is a dream ice-cream, Sues!! Genius! Oh wow, I’m loving this so much. Such a great color! And yes….. I’m all about bad reality tv all the time! I’d never make it in reality TV for the same reason as you. As much as I enjoy watching the drama on TV I HATE it in real life! But I love this ice cream :). The addition of cookie dough has me swooning! First, amazing photography!! Love this. Red velvet is one of my favorite flavors and this ice cream is just BRILLIANT!!! I love red velvet cake, and red velvet cookie, and basically, anything red velvet. 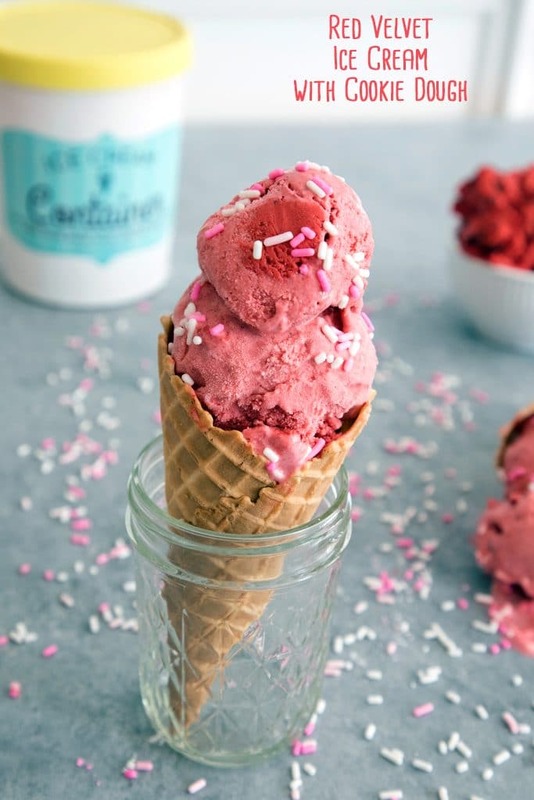 In short, I need this red velvet ice cream in my life! Such a genius idea, and with red velvet cookie dough too, oh my! I have two kiddos who are red-velvet obsessed, and the apple doesn’t fall far from the tree if ya know what I mean. This is bound to be a new favorite around my house! My boyfriend would LOVE this ice cream! And totally hear you on watching reality tv and being able to multi task and half watch yet still understand everything going on. And I too would be a producer’s nightmare — I would stay out of all the drama too and just sit quietly or cook for everyone! Oh wow. The colour of this is amazing! The perfect way to cool down in the summer heat. 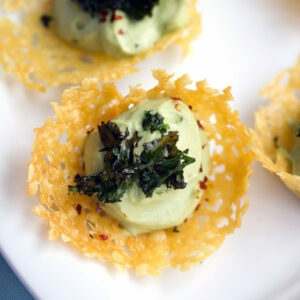 Can I just say a thousand yeses to this amazing recipe? It has EVERYTHING. Such genius idea, ice cream made with buttermilk.wow! This would be a lovely treat for little girls parties. Red velvet has long been a favorite flavor of mine and this ice cream looks awesome!! I will take a big scoop please! I am completely with you on the zoning-out but still know what’s going on type of TV!! This ice cream is just so decadent. I would probably eat it all in one sitting!! Dangerous…!! What a deliciously decadent ice cream treat! 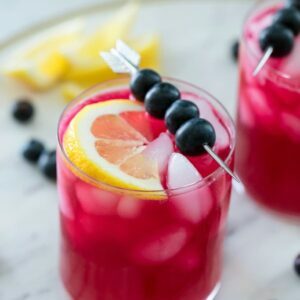 Such a fun recipe for summer! OMG this ice cream looks amazing! And it has cookie dough! Yum!! I just love the intensity of flavor here! And, I mean red velvet AND cookie dough?? Sign me up! 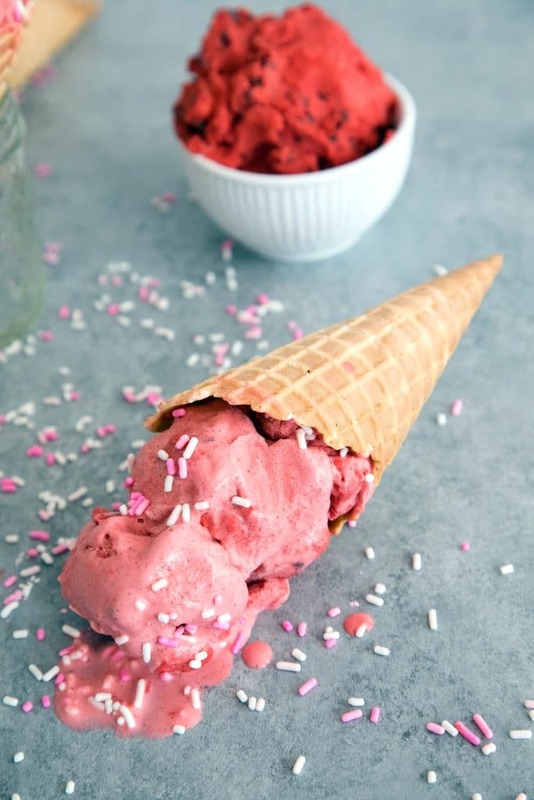 Such a great recipe to really take that summer afternoon ice cream fix to the next level! You had me at cookie dough, that’s all I need in life! Hands down the best ice cream right here! Plus it is adorable! Everyone I know that has tried it absolutely loves it! This looks really delicious! 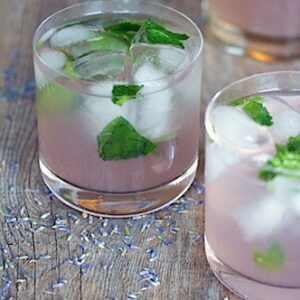 I can’t wait to try your recipe for spring break! I need to watch more mindless Tv. My husband usually gets to the remote first, and we end up watching this ridiculous drama that you have to pay total attention to or you are lost. I get sucked in every time. LOL This ice cream looks great! That is one beautiful scoop of ice cream! I am always on a quest for good ice cream recipes and I have never come across this tasty combination before. Looks yummy! Amazing photography! Red velvet is one of my favorite flavors and this ice cream is just wonderful. So pretty & it’s actually warm in my area today. Perfect for one of these, and I could definitely use some indulgences in my life like this. I love buttermilk in ice cream! It gives that interesting tang to the flavor. Such a pretty color too! That color! Oh my gosh I bet it tastes just as good as it looks. My husband LOVES red velvet cake… I think I’ll surprise him with this. This looks absolutely amazing! I need to make this for dessert tonight! you had me at red velvet ! your photos are adorable which makes me want to make it even more ! Wow, this looks delicious! Can’t get enough of red velvet cake, cupcakes, cookies….well, red velvet anything! I totally get it on the million things part…and I fully support your decision to watch TV and eat ice cream! Looks fabulous too! Everything about this ice cream is gorgeous! I love the color and the flavor combination sounds amazing!